Antelope Audio is now shipping the Goliath HD, its new Thunderbolt/USB3.0/HDX Port/MADI pro audio interface that received its debut at Musikmesse 2017 in Frankfurt last week. 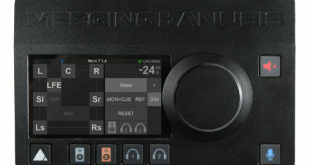 The new unit features 64 channels of high-quality I/O and 16 adaptable Accusonic mic preamps with individual push-and-turn-style volume controls in a modest-sized 2U rack device, which can all be controlled remotely through dedicated iOS and Android apps. 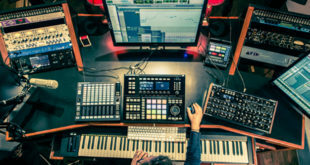 Goliath HD makes use of Antelope Audio’s comprehensive suite of hardware-based FPGA (Field Programmable Gate Array) effects, providing hardware models of vintage effects with realtime performance to both Pro Tools HD and Native DAW systems. 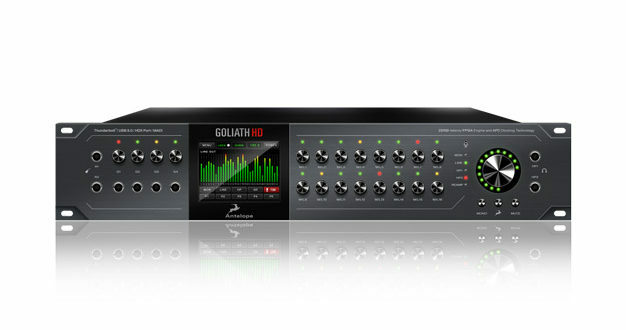 With its range of connectivity options, Goliath HD can also interface with a Pro Tools HD and Native DAW setup simultaneously. The interface’s 32 analogue inputs achieve 124dB of dynamic range while its outputs offer up to 129dB. Monitor outputs also reach heights of 132dB thanks to new dynamic range-boosting technology. While supplying analogue connectivity through its mic preamps and multiple 25-pin D-SUB connectors, Goliath HD has several specialised inputs and outputs including four front panel-positioned guitar DI inputs, two transformer-based re-amp outputs, an inbuilt talkback mic, and two headphone outs, plus a pair of rear-mounted analogue inserts. It also utilises an abundance of clock signal distribution connectivity with AES/EBU, MADI, ADAT, S/PDIF, and BNC connectors (for loop sync or standard word clock usage). Meanwhile, the Goliath HD desktop application facilitates full control of input and output routing, as well as sub-mixes and effects processing. The company’s recently released Session Presets application allows specific FPGA effects and HDX compensation settings to be instantly recalled and shared, making the interface ideally suited to Pro Tools HD-based studios with multiple rooms or artists working in several environments. 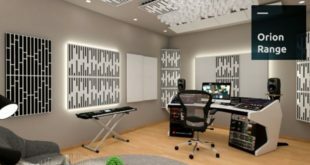 Additionally, the unit is powered by a powerful ESS chips available and Antelope Audio’s AFC (Acoustically Focused Clocking) jitter-management technology.